I returned to Taobaoland after the Lunar New Year and we have a new housemate. Meet Haku, the 5-month old Husky. This puppy is already up to my mid-thigh with a big appetite to match. 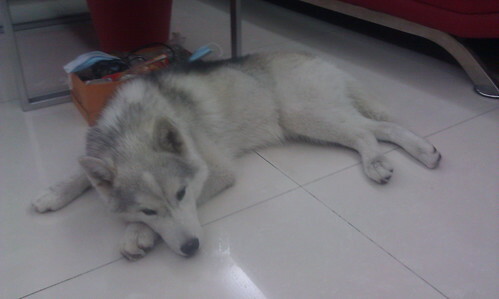 He confirm will mega fail as a guard dog as he is very good nature and friendly to everybody. Even strangers. He loves my tennis balls which might as well let him have them since I don't play tennis anymore. Now if only I can get him to return the ball instead of slobbering all over it. The great thing with a good-tempered dog is that he is a very quiet. It's been two days since I am back, I haven't heard him bark once. No woof, no yelp, no growl. Nada. Zilch. Nothing. The occasional whining when we lock him up in the bathroom last night while we clean up his MEGA POO POO, so lovingly left for us in the living room. We need to toilet train this fella. Need to get lotsa bleach to mop the floors. p.s. Just to kachow him, we called him Saku sometimes...... that's condom in Ta1wanese. Haha. What's a winter dog doing in Taobaoland?? Good luck with the dog. Train him well! Starmist: Yeah. Very adorable dog. Aloe: Blue eyes? This I gotta check. Arrenn: Still a puppy but relatively big at his age compared to other pedigrees. It used to belong to a staff who couldn't take care of it anymore for some unknown reason. It's a xmm magnet alright..... now if only I know how to stop them from trying to eat the dog! "Eating the dog" is so typically QQLandish! :P Seriously though, they prefer certain breeds for their cuisine, right? Not any canine? I have no idea. Perhaps skinny dogs got not enough meat or fatty dogs are too oily? I think mutts are the only ones available since pedigrees are way too expensive to eat. Then again, I feel it is very unsafe to be eating strays caught off the streets. Who knows what diseases they are carrying?